The Atlanta rapper’s Pharrell-indebted track gets a guest verse. Madeintyo's Pharrell-channeling "Skateboard P" now has an official remix, with Big Sean stepping in for a guest 16. Sean teased the collab with a brief snippet last week, and today we have the final, complete with some trademark double time bars. 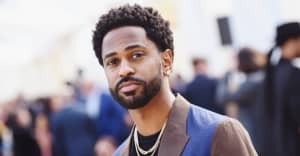 The track comes on the heels of two new releases from Big Sean this week, the all-around vent session "No More Interviews" and the Metro Boomin-assisted "Bounce Back."